Welcome to the Big “L” Club – the Club that has members all over the British Isles and also Holland, France, Denmark, Sweden, Germany, Poland and even America, Africa, Indonesia and New Zealand. The station doesn’t of course cover this great area but nevertheless its fame seems to have spread throughout the world. About the Ship . . . She is a converted U.S. Minesweeper, 10000tons – during the last war she swept over 500 mines, shot down 4 enemy aircraft and rescued hundreds of survivors from the sea. She is now called the M.V. GALAXY and is anchored 4 miles off Harwich. The Radio Transmitter is a 50kw R.C.A. Ampliphase and the Antenna is a shunt fed 200 ft. high mast. The Ship’s Crew, which numbers 24, includes 6 engineers – three of whom are in charge of the transmitter. 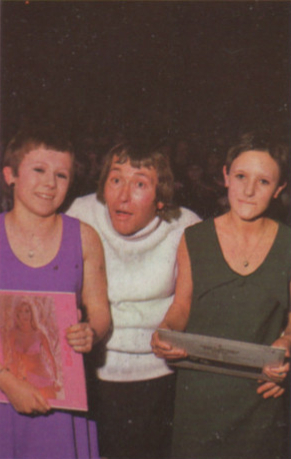 A Cook Steward and his two assistants look after the catering side. TONY WINDSOR – Born in Melbourne, Australia. His first serious job was when he joined the broadcasting station 2 S.M. Sydney as a Sales Representative, later working as an announcer. He afterwards became the Station’s Number One D.J. and remained with them for seven and a half years. The highest rated D.J. in Australia, he was offered the No.1 spot with the Macquarie Broadcasting Network operating 87 stations – the biggest network “Down Under”. He is 6’2″, dark haired, blue-eyed. Keen on tennis, cricket, boxing and horse-racing, he is also a member of 32 surf clubs. EARL RICHMOND – Born in Highgate, London. 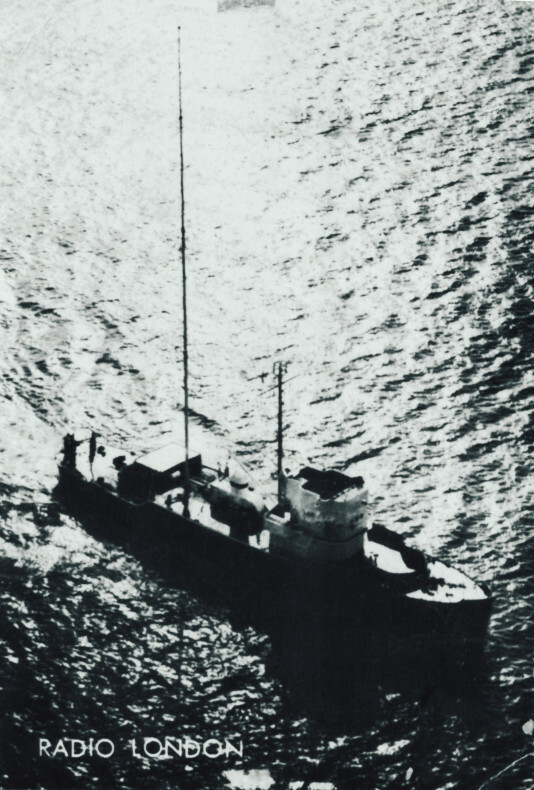 Started with the Forces Broadcasting Service in September,1948, as Announcer and Scriptwriter in Trieste. Continued with F.B.S. from 1951-1957, gaining experience in all aspects of sound broadcasting. He freelanced in various stations all round the world, then studied television in the United States. In July 1959 he joined I.T.V. as a Transmission Controller, and later did freelance work with Southern Television before joining Radio London as a Disc Jockey. DAVE DENNIS – Born in Croydon. Originally took up farming and the outdoor life, but this career was not to last long, as he wanted to act. He studied drama for three years at the Central School before going into Repertory. Early in 1964 he decided to turn to Radio and has, since then, been working as a D.J. Hazel-eyed, slim, dark, 6’0″, his hobbies are writing and wireless. PETE BRADY – Born in Montreal and educated there. 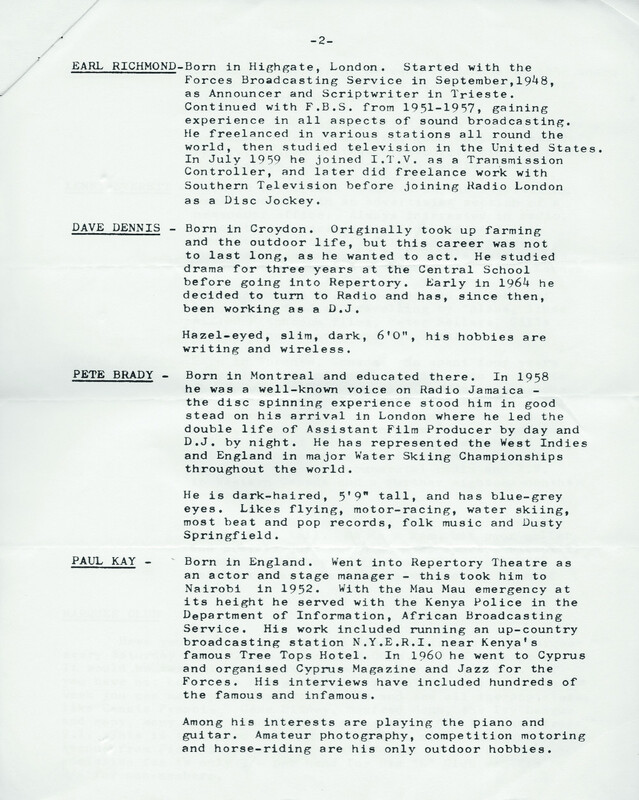 In 1958 he was a well-known voice on Radio Jamaica – the disc spinning experience stood him in good stead on his arrival in London where he led the double life of Assistant Film Producer by day and D.J. by night. He has represented the West Indies and England in major Water Skiing Championships throughout the world. He is dark-haired, 5’9″ tall, and has blue-grey eyes. Likes flying, motor-racing, water skiing, most beat and pop records, folk music and Dusty Springfield. PAUL KAY – Born in England. Went into Repertory Theatre as an actor and stage manager – this took him to Nairobi in 1952. With the Mau Mau emergency at its height he served with the Kenya Police in the Department of Information, African Broadcasting Service. His work included running an up-country broadcasting station N.Y.E.R.I. near Kenya’s famous Tree Tops Hotel. In I960 he went to Cyprus and organised Cyprus Magazine and Jazz for the Forces. His interviews have included hundreds of the famous and infamous. Among his interests are playing the piano and guitar. Amateur photography, competition motoring and horse-riding are his only outdoor hobbies. 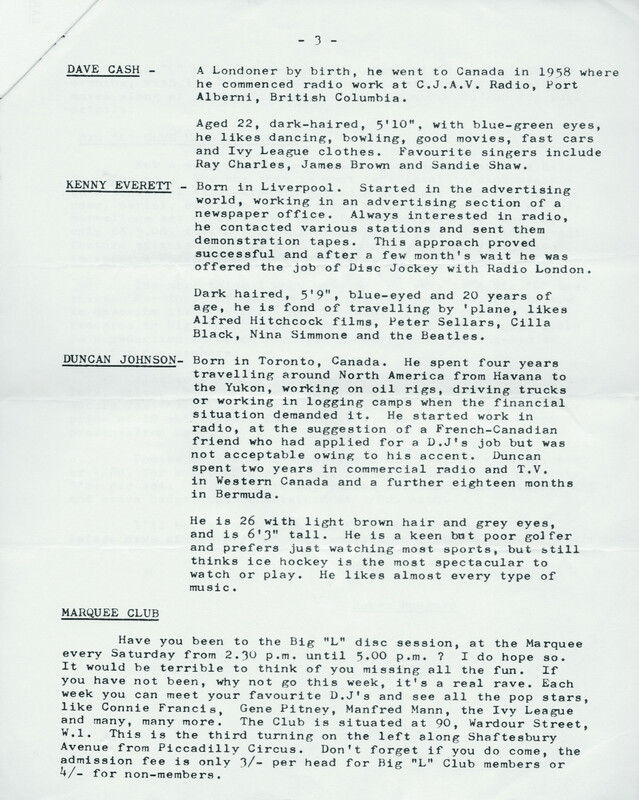 DAVE CASH – A Londoner by birth, he went to Canada in 1958 where he commenced radio work at C.J.A.V. Radio, Port Alberni, British Columbia. Aged 22, dark-haired, with blue-green eyes, he likes dancing, bowling, good movies, fast cars and Ivy League clothes. Favourite singers include Ray Charles, James Brown and Sandie Shaw. KENNY EVERETT – Born in Liverpool. Started in the advertising world, working in an advertising section of a newspaper office. Always interested in radio, he contacted various stations and sent them demonstration tapes. 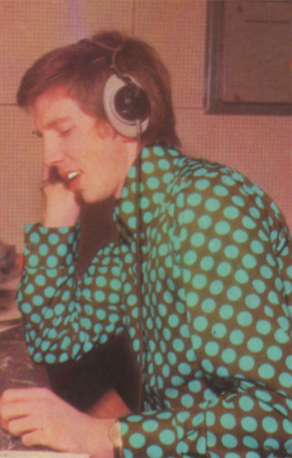 This approach proved successful and after a few month’s wait he was offered the job of Disc Jockey with Radio London. 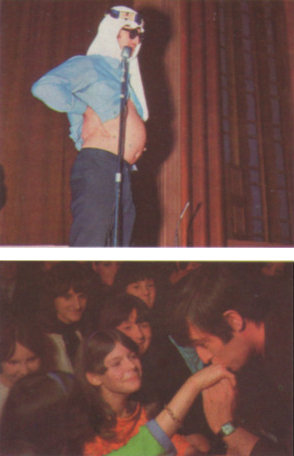 Dark haired, 5’9″, blue-eyed and 20 years of age, he is fond of travelling by ‘plane, likes Alfred Hitchcock films, Peter Sellars, Cilia Black, Nina Simmone and the Beatles. DUNCAN JOHNSON – Born in Toronto, Canada. He spent four years travelling around North America from Havana to the Yukon, working on oil rigs, driving trucks or working in logging camps when the financial situation demanded it. He started work in radio, at the suggestion of a French-Canadian friend who had applied for a D.J’s job but was not acceptable owing to his accent. Duncan spent two years in commercial radio and T.V. in Western Canada and a further eighteen months in Bermuda. He is 26 with light brown hair and grey eyes, and is 6’3″ tall. He is a keen but poor golfer and prefers just watching most sports, but still thinks ice hockey is the most spectacular to watch or play. He likes almost every type of music. Have you been to the Big “L” disc session, at the Marquee every Saturday from 2.30 p.m. until 5.00 p.m.? I do hope so. It would be terrible to think of you missing all the fun. If you have not been, why not go this week, it’s a real rave. Each week you can meet your favourite D.J’s and see all the pop stars, like Connie Francis, Gene Pitney, Manfred Mann, the Ivy League and many, many more. 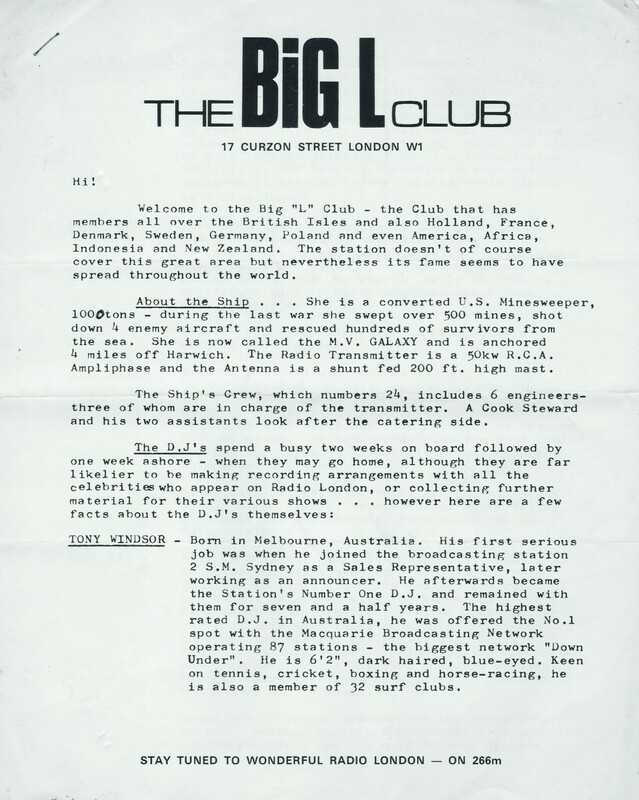 The Club is situated at 90, Wardour Street, W.1. This is the third turning on the left along Shaftesbury Avenue from Piccadilly Circus. Don’t forget if you do come, the admission fee is only 3/- per head for Big “L” Club members or 4/- for non-members. Big “L” also visits the Wimbledon Palais every Saturday evening, with its Popular D.J’s there to see that everything moves along at a frantic pace. Keep listening to 266 for full details. Now a word about the fabulous special bargains we have to offer you. The one that is most beneficial to club members is a wonderful eight-transistor radio complete with carrying case, aerial, earphone and an extra battery. The price of this marvellous set is £5.15.0d. but club members can get one for only £5.5.0d. that’s a saving of 10 shillings. One other great feature of this radio is that it has been specially adjusted to receive Radio London loud and clear. The next thing I know many of you want is a Big “L” tee-shirt. For those of you who have not yet seen one, let me try to describe it. The front has the R.L. symbol, and the back features in big, bold black lettering – BIG L 266. 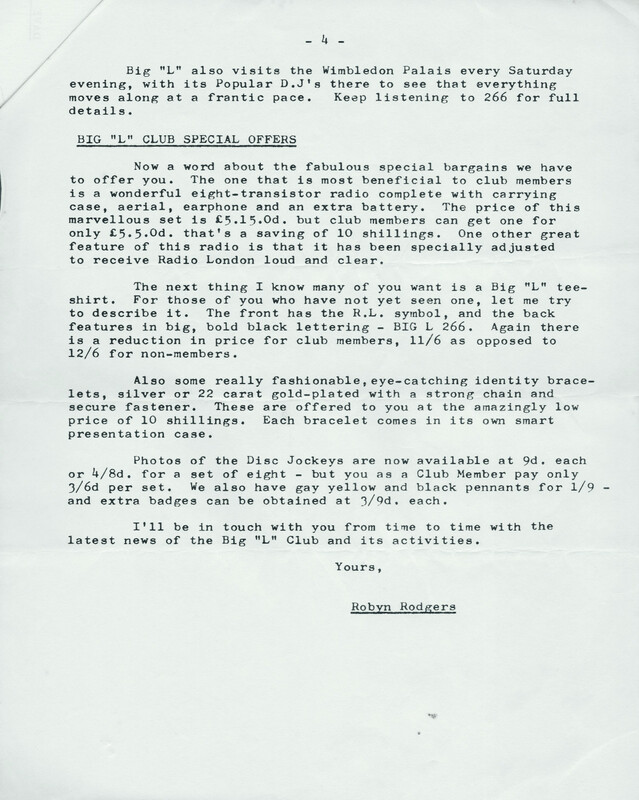 Again there is a reduction in price for club members, 11/6 as opposed to 12/6 for non-members. Also some really fashionable,eye-catching identity bracelets, silver or 22 carat gold-plated with a strong chain and secure fastener. These are offered to you at the amazingly low price of 10 shillings. Each bracelet comes in its own smart presentation case. Photos of the Disc Jockeys are now available at 9d. each or 4/8d. for a set of eight – but you as a Club Member pay only 3/6d per set. We also have gay yellow and black pennants for 1/9 – and extra badges can be obtained at 3/9d. each. I’ll be in touch with you from time to time with the latest news of the Big “L” Club and its activities.